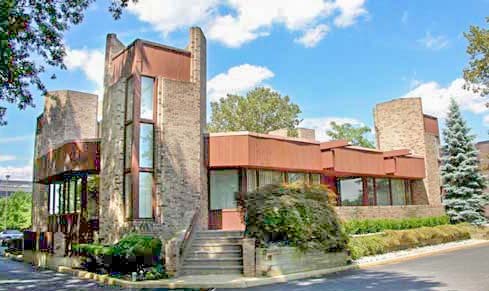 At first glance, the uniquely-constructed dental office building, with its four brick towers looming skyward, resembles a medieval castle. Although the exterior mirrors another era, the modern, highly-functional interior provides the perfect blend of aesthetic appeal and efficiency for Red Bank, New Jersey, periodontist Anthony N. DiCesare. A course he attended on dental-office design gave him the inspiration he needed to move ahead with firm plans for his new office. As with so many other successful dentists, Dr. DiCesare’s practice was outgrowing his office when he attended a course on dental-office design presented by Dr. Neil Brahe. Ten creatively-designed offices were featured during the course that reflected the needs and personalities of their doctors. Following the painstaking research on dental-office design, Dr. DiCesare took his ideas to architect Paul Reilly (who brought extensive experience in hospital and church design to the project). They chose a building site at an interchange of a major New Jersey artery to assure an easily accessible location for patients. “It’s a clearly recognizable landmark from the Garden State Parkway,” adds Dr. DiCesare. The interior of the 1,919-square-foot facility is designed in a circular configuration aroudn a central hub. A sterilization and instrument-preparation area makes up the central hub. Radiating from this hub, like the spokes of a wheel, are five operatories, a private office, reception area, laboratories, darkroom and storage facilities. Several walls/partitions are completely free-standing, while others run to the ceiling for privacy and light exclusion. Ceilings are constructed of four-inch, tongue-in-groove natural wood planking. Walls in the central core are covered with a light gray, textured paper; operatories are painted bone-white. Doors, woodwork and the external shell of the sterilization area are kept a natural, unstained white oak. The primary operatory and private office measure 8 feet by 10 feet with 18-foot ceilings and corner windows that run from floor to ceiling. The rooms appear huge and non-confining. Recessed lighting, use to enhance the office’s natural lighting, is a key element in creating the warm, non-threatening environment. Except for the modification of one operatory to allow for implant dentistry, the office has not been modified since its origial design. “Patients are amazed by its openness and contemporary style,” says Dr. DiCesare. “With today’s emphasis on cleanliness and sterility in dental offices, the centrally-located and very visible sterilization area is proving to be a big comfort to our patients.